Folklink - Your guide to communicating in the multicultural society. • Have you realised the power of diversity? Do you currently have strategies for ethnic marketing? Are you aware that immigrants stand for billions in spending power? Ethnic marketing means to be more successful in communicating with immigrant groups. It means to show different cultures, customs, traditions and ways of thinking and to be able to use our differences to our advantage. It also means being aware of similarities that unite us. Correctly used ethnic marketing can greatly increase a company’s profitability. All organisations need knowledge about ethnic communication for marketing, recruitment and establishment. Folklink reaches out to companies, organisations and authorities that want to reach more nationalities in addition to the Swedish population. By helping companies to increase awareness of the needs of different ethnicities, we help you to develop more effective and successful marketing strategies. Are you effective at intercultural communication? Intercultural communication means communicating with groups on their terms. In order to do that, you need knowledge about that group. We believe that organisations that think “diversity” will be the winners in the future. • Have you found your own perfect spot in the world? The multicultural society is full of perfect marketing spots. Folklink helps you to find your perfect spot. To be a link between cultures and contribute to increased communication and business between Swedish people and other nationalities. To help to decrease fears and prejudices between cultures. To increase knowledge about the cultural resources there are in every organisation. To communicate the similarities which unite us instead of the differences. My goal is to open the doors of communication between different cultures and to increase awareness of different ethnicities for the purpose of creating greater awareness as well as target markets. Having lived in Sweden for many years and having my roots in a different culture, I have learned the benefits of a multicultural society. I came to Sweden from Iran over 22 years ago. I live in Storvreta outside Uppsala with my three children. I now celebrate both Swedish and Persian traditions. The more the merrier! I want to communicate these benefits to Swedish companies, authorities, organisations and citizens. • Owning and operating my own interpretations company for 5 years. This work involved translation services and working on integrations. • I have worked for BBC world service. 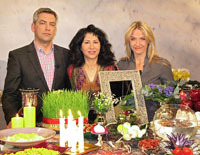 • I have taught courses in Persian cooking and seminars about integration and diversity. Several of these have been televised. • I have participated in several radio and TV programs teaching and sharing my passion for integration. • During my 22 years in Sweden, I have worked with 40 different nationalities. I will help you with everything from strategic advice in ethnic marketing, courses and workshops on how you create cultural meetings through cooking and games. I will guide you so that you can see the opportunities and foresee the obstacles and get you over the hurdles. How can you as a self-employed person increase profitability via ethnic groups? What obstacles can appear along the way? I will guide you to the proper concept and help you think in new, wide and creative ways. Do you communicate in the same way regardless of to which group? I will help you work out texts and layout directed to different ethnic groups and I will show you which channels to use. It can be everything from a single advertisement and informational text to planning and running a whole campaign. 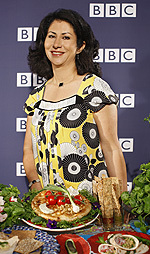 I emphasise the importance of food and using foods from different cultures. I believe this is important because cooking is a way of getting to know each other and works as a door opener between cultures. To taste and explore eachothers food is also a way of reducing prejudices. For more information on how I can help you in communication with immigrants, or to book me for a lecture, work shop or seminar please contact me. 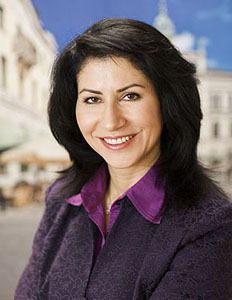 telephone+46( 0)707 - 593 685 or e-mail me at laleh@folklink.se.